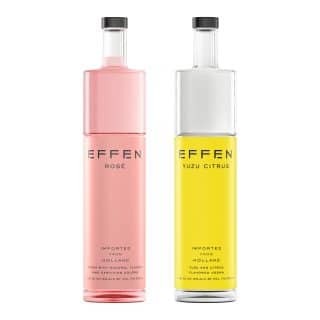 CHICAGO— EFFEN Vodka, a super-premium and smooth vodka, is proud to announce the addition of two new flavors to its lineup: EFFEN Rosé and EFFEN Yuzu Citrus. These new offerings celebrate two varied, dynamic flavor profiles that embody the clean, crisp taste fans love and expect from EFFEN Vodka. To learn more about EFFEN Vodka, visit effenvodka.com or follow EFFEN Vodka on Instagram or Twitter. EFFEN Vodka is a premium Vodka whose name means smooth, even and balanced in Dutch. It is made from 100 percent premium wheat, which results in a silky, smooth liquid. The stylish and functional rubber sleeve is carefully affixed to each bottle, further demonstrating EFFEN’s commitment to providing a Super Premium Vodka with a modern design. The EFFEN line includes EFFEN Vodka, EFFEN Cucumber Vodka, EFFEN Black Cherry Vodka, EFFEN Blood Orange Vodka, EFFEN Green Apple Vodka and EFFEN Raspberry Vodka. EFFEN is sold nationwide and is available in 50ml, 375ml, 750ml, 1L and 1.75L bottles. For more information on EFFEN Vodka, please visit effenvodka.com. Beam Suntory was created in 2014 by combining the world leader in bourbon and the pioneer in Japanese whisky to form a new company with a deep heritage, passion for quality, innovative spirit and vision of Growing for Good. Headquartered in Chicago, Illinois, Beam Suntory is a subsidiary of Suntory Holdings Limited of Japan. For more information on Beam Suntory, its brands, and its commitment to social responsibility, please visit beamsuntory.com and drinksmart.com.